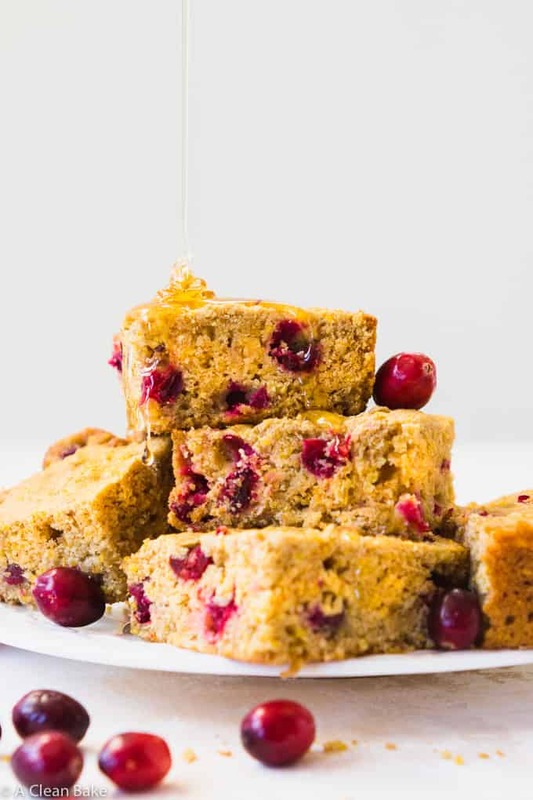 Jump to RecipeThis gluten free cornbread is tender, slightly chewy from the coarse cornmeal, and lightly sweetened with coconut sugar and a touch of maple syrup. 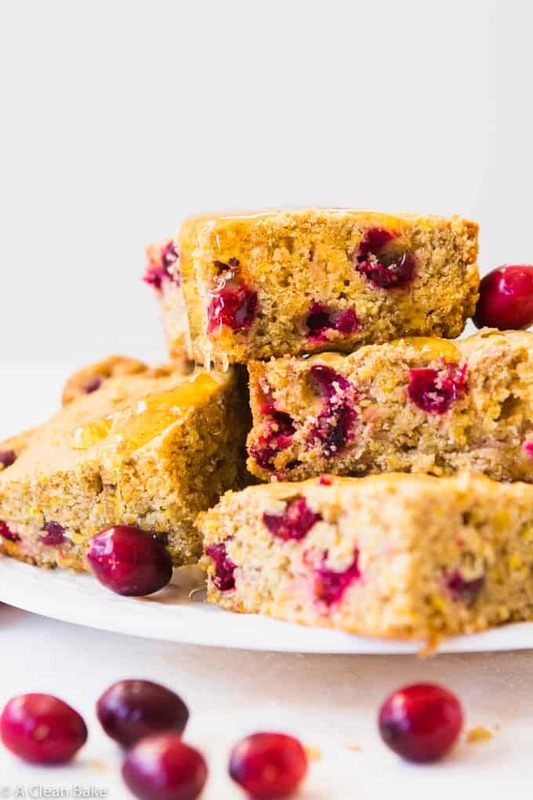 It’s also dairy free, and the fresh cranberries folded into the batter give the cornbread burst of color and flavor. You’ll definitely want to keep this cornbread in your dinner rotation! I know what you’re thinking: cornbread? But Thanksgiving is over! But what about Christmas? Or just… dinner? 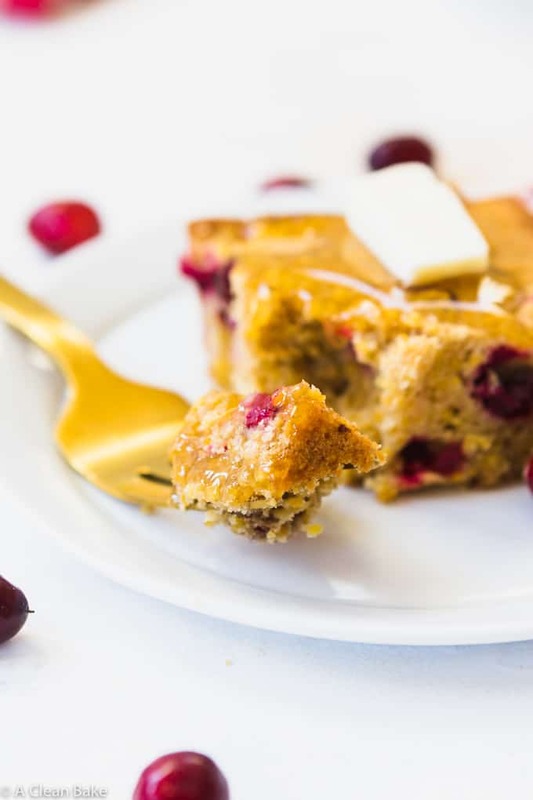 If you’re not adding gluten free cornbread to your normal dinner rotation, it is time to start! 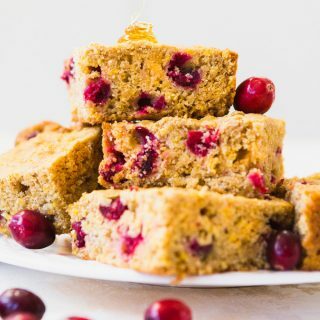 This past Thanksgiving, I was tasked with bringing the cornbread which, in past years, I’ve skipped altogether out of a lack of time to make a really good gluten free version. But I was given an assignment. I’ve never not turned in my homework in my life, and I wasn’t about to start now. I started by consulting the best cornbread recipe I know of: the one from the Fanny Farmer Junior Cookbook. Fannie was a really old school culinary expert (the predecessor to a celebrity chef) who, in the late 19th century, published the first cookbook to use standardized measuring cups and spoons. It was originally called the Boston Cooking School Cookbook. But it because so ubiquitous and so strongly associated with Fanny, that they renamed later editions to The Fanny Farmer Cookbook. Then, someone seemingly unrelated to Fanny or her cookbook empire, borrowed her name and published the Fanny Farmer Junior Cookbook, full of simple recipes that kids can follow. Although it was originally published in the ’40s, a copy somehow found its way into my parents’ kitchen and it is the second book* I learned to bake from. The cornbread recipe from this book has been my go-to since childhood. What does Fanny have to do with gluten free cornbread? Nothing, except that the junior cookbook that bears her name, but may or may not have absolutely no affiliation with her otherwise, contains a recipe for the most satisfying (gluten) cornbread I have ever had. I know you think your mom’s/uncle’s/grandma’s/third cousin’s/hair dresser’s gluten-y or gluten free cornbread is the best. I’m so sorry to be the one to have to break this to you, but it’s really not. Fanny’s is. Or, guy who licensed Fanny’s name’s is. All you have to do is to look at the recipe to know it’s going to be great. It has all the markings of a cornbread that you know you’ll go back in for seconds on. Granulated sugar for sweetness (so. much. sugar). It’s EASY to make! Mix the wet ingredients, mix the dry ingredients, combine. That’s it. But at the same time, all you have to do is look at the recipe to know that just one bite will make you regret ever being born, so there was some work to do. Hold the gluten, not the grains. I used Licensed-Fanny’s-Name-Guy’s recipe as a guide, but made this recipe into something you can eat, and your whole family will enjoy with you. The butter has been replaced with coconut oil (although you can still use butter if you want), making this cornbread recipe dairy free. The white cane sugar was swapped out in favor of coconut sugar and maple syrup (and the amount drastically reduced), the buttermilk is gone and in its place is full fat coconut milk (so rich! But you can feel free to use almond milk if you prefer something a little lighter). And the all purpose (wheat) flour has been replaced with a combination of corn flour (masa) and gluten free all purpose flour. You can use any gluten free flour that you have had success with in other gluten free recipes, but I really like NOW Foods’ gluten free all purpose flour blend – which does not contain xanthan gum! – for this job. This bread is the holy grail of gluten free baking, in that it doesn’t taste “gluten free” which, of course, is a well-known euphemism for “dry, tasteless, and crumbly”. 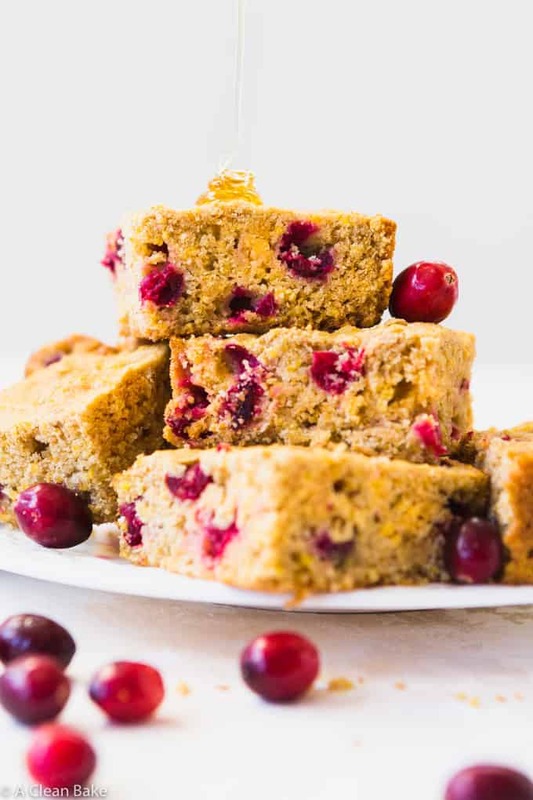 And while we’re on the subject, you’ll never know it’s dairy free either; it tastes just as rich as the conventional, buttery version of cornbread. Finally, I prefer to bake mine in an 8-inch square baking pan because that’s how I grew up making cornbread. But if you’re a die-hard believer in the importance of making cornbread in a cast-iron skillet, far be it for me to stop you. You’ll need about a 10″ skillet, and you may need to adjust the baking time. This gluten free cornbread is moist and tender. It is easy to make, beautiful on the table, and delicious enough to hold its own beside any main dish. You guys seem to enjoy the occasional whole grain (i.e. not Paleo), gluten free recipes around here, and this is one of them. If you can tolerate corn, I highly recommend giving this bread a try! * In case you wondered, the first book I learned to bake from was called The Alpha Bakery Gold Medal Flour Children’s Cookbook, and contained 26 recipes (one for each letter). It was one of those prizes that you could send in for by sending a wad of cut out proofs-of-purchase from bags of – you guessed it! – Gold Medal Flour to the company, and then waiting patiently by the mailbox for 4-6 weeks for the thick envelope containing your cookbook. 9 year old me highly recommends the Turtle Bread. You’ll find it after strawberry shortcake, but before upside down pineapple cake. **Update: You can still get The Alpha Bakery Cookbook on Amazon!!! It is definitely not healthy or gluten free though. 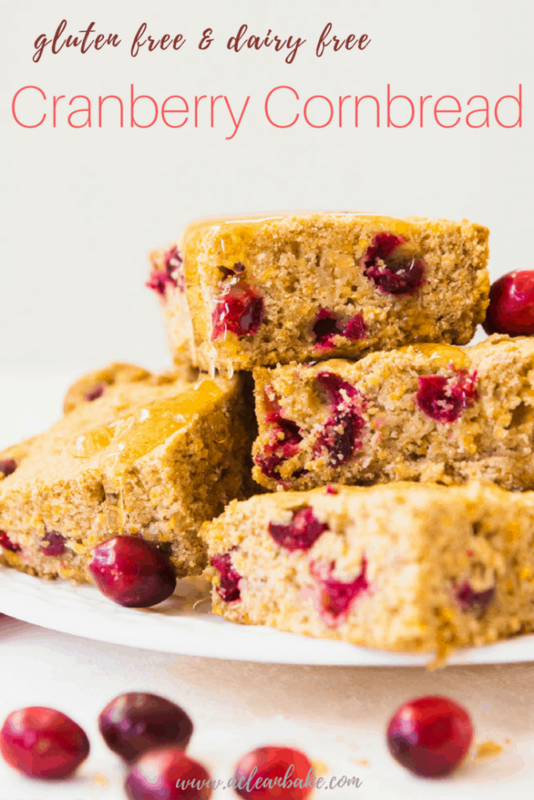 This gluten free cornbread recipe is a keeper! It's tender, slightly chewy from the coarse cornmeal, and lightly sweetened with coconut sugar and a touch of maple syrup. 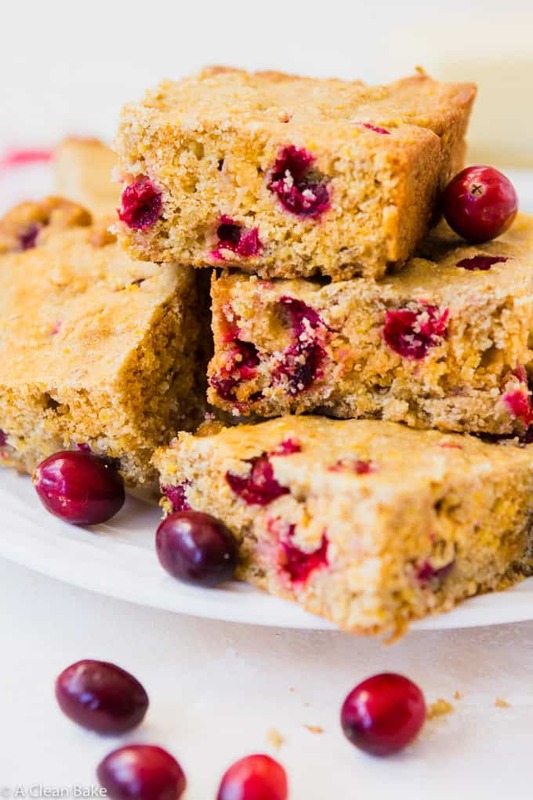 The fresh cranberries folded into the batter give the cornbread burst of color and flavor! You'll definitely want to keep this cornbread in your dinner rotation! Preheat the oven to 400°. Lightly grease an 8"x8" square baking pan and set aside. In a medium mixing bowl, whisk together the GF flour, cornmeal, corn flour, coconut sugar, baking soda, and salt. Set aside. In a large mixing bowl, whisk the eggs, then stir in the coconut milk, coconut oil, maple syrup, and lemon juice. Add the dry mixture to the wet and stir to combine. Pour batter into prepared baking pan and smooth into an even layer. Bake for 40-45 minutes, until the top is crisp and a tester comes out clean. Store leftovers in an airtight container in the refrigerator for up to 3 days, or in the freezer for up to a month. Adapted from The Fanny Farmer Junior Cookbook. Could you substitute flax egg for eggs? I haven’t tried it, but I wouldn’t recommend it. In a recipe like this, the flax egg will likely make the batter much too wet (meaning a really long cook time) and when it’s done, I don’t know if it would hold together. There’s nothing wrong with trying it if you want to take the risk!